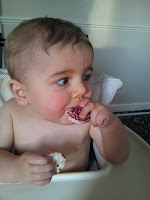 Weaning has been a very exciting journey for both Jack and I. We have not had any problems with him not liking food, only once not liking a jar food. Jack really enjoys his solid foods, especially ones he can feed himself and get in a mess with. 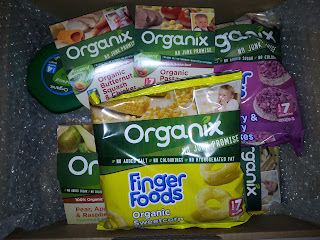 The lovely people at Organix sent us this lovely hamper of food for the purpose of this review. 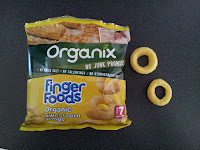 Organix was created in 1992 by Lizzie Vann, she wanted to create a food in which she hadnt yet seen within the stores. This was using only organic ingredients, not adding anything which wasn't necessary. Now there is a tem of 40 staff members whom are all passionate about the same thing. 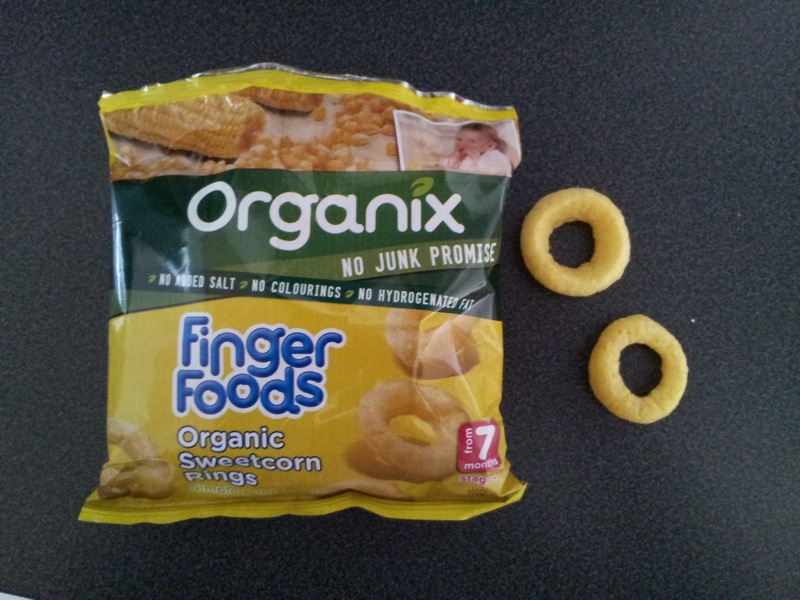 Another exciting thing about Organix is they have a 'No Junk Promise,' therefore no unnecessary ingredients are placed within the food. Organix have a three pillar promise which is Safe, Pure and Nutritous. Upon receiving the hamper there was a lovely note inside the box, alongside a lovely selection of food including finger foods, fruit purees and two steam cooked meals. The little note read 'Thank You for trying our foods. We hope they are enjoyed very much. Best Wishes. From all of us at Organix.' I thought this was a lovely little touch. First we tried the Butternut Squash & Chicken Steam Cooked Meal. 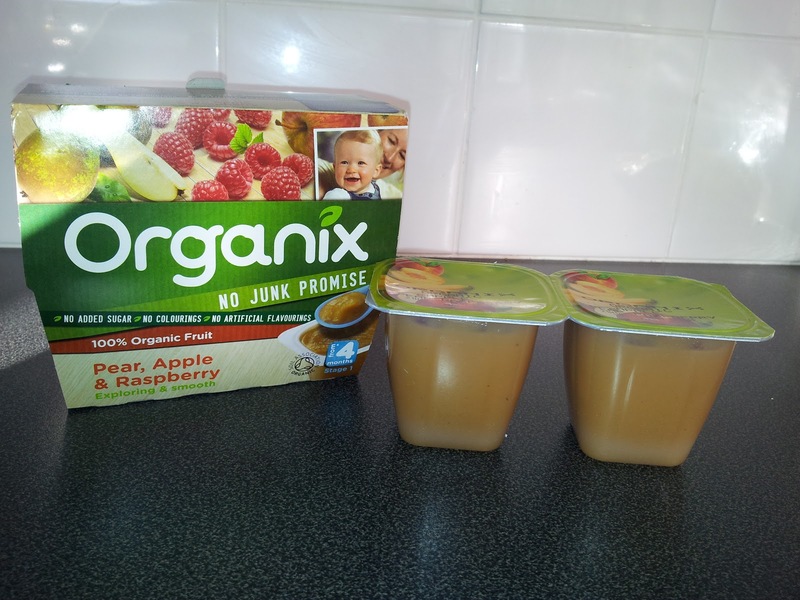 This was a big hit with Jack; the texture was nice and smooth as it a purée suitable from 4-6months. This meal includes butternut squash, pumpkin, carrots and free range chicken. I gave Jack the sealed container for him too look at what he would be eating, I find this encourages him to taste the foods. 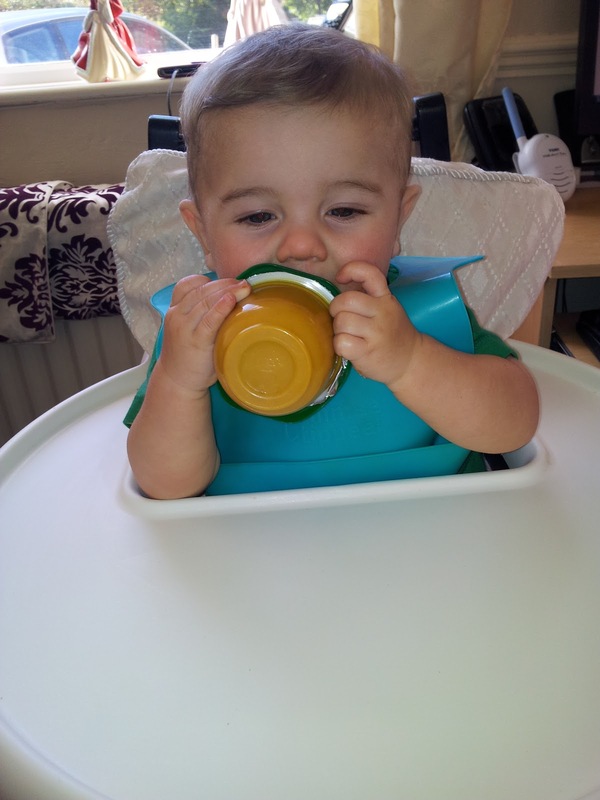 He was very intrigued and once he started having spoonfuls he couldn't get it in quick enough. I think this is a perfect first purée, especially as they are steam cooked locking in all the goodness. 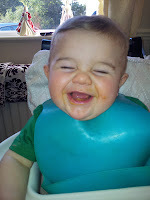 We also had a 7 month Steam Cooked Meal to try which was Pasta Stars with Bolognaise Sauce. 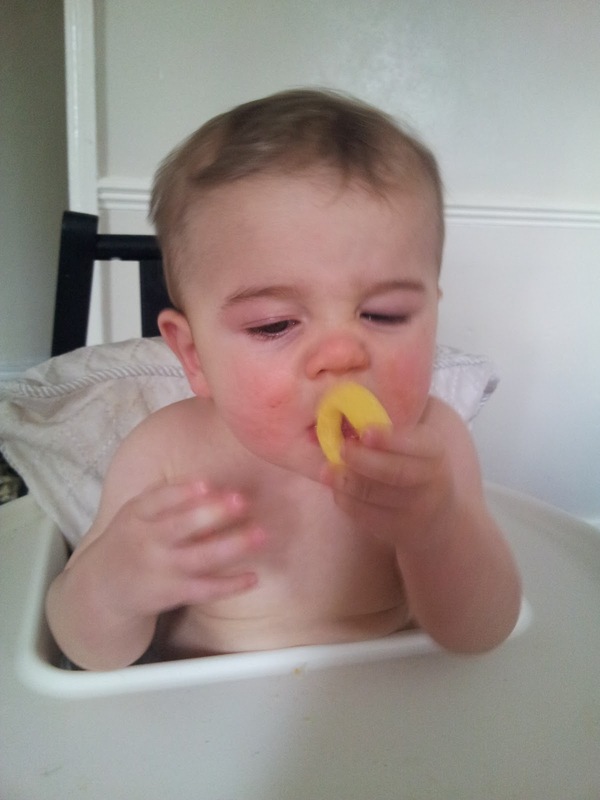 I had never tried Jack with pasta Bolognaise before, so was interested to find out how he would react. Again, giving him the small container to look at the food. Yet again the Bolognaise was a big hit with Jack and even wanted more when the serving was finished. 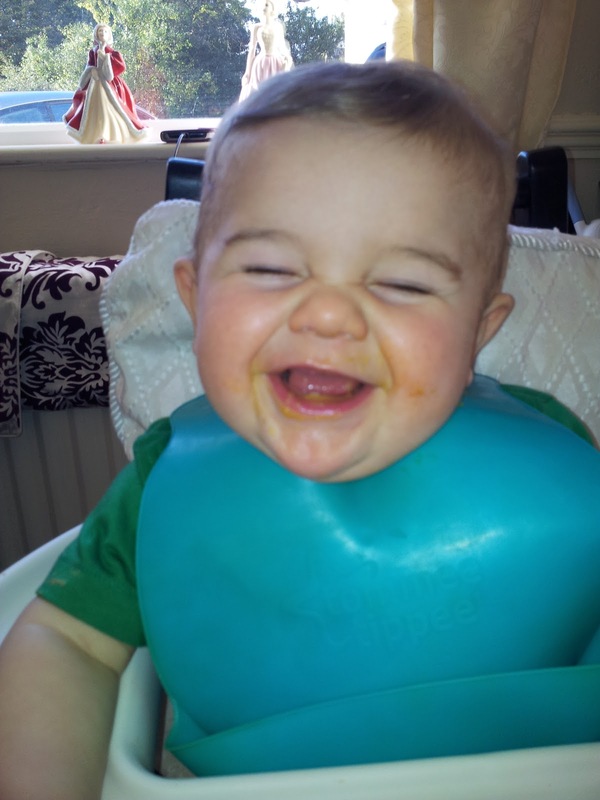 Bolognaise is a big favourite of my own, maybe that is why Jack enjoyed. The container contains small tiny pasta stars which were easy for Jack to swallow and digest not causing him any problems. The meal ncludes tomatoes, carrots, pasta stars and mince. Both of the Steam Cooked Meals came in a pack of two. <Within the hamper we received a four pack of fruit purees, I gave these as a desert to Jack; we had tried other purees before so guessed we wouldn't have a problem with these. The fruit purees are suitable from 4-6months, the purees in which we received were Apple, Pear & Raspberry. 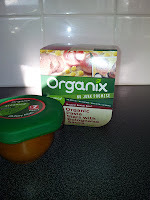 There is a varied range in which Organix do. These smelt really yummy, and were throughly enjoyed by Jack. 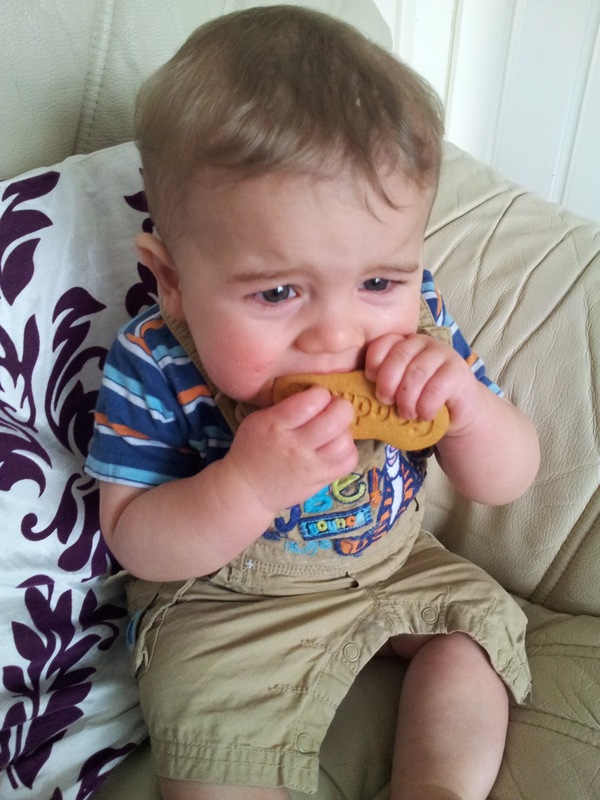 The smooth texture made it easy for him to swallow, and suitable from a younger age. We received three snacks within the hammer, these were great for use within the day when getting a little peckish or for use after swimming. 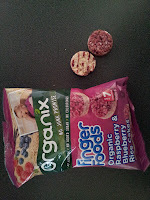 The first of these in which we tried were the Raspberry & Blueberry Rice Cakes, these are suitable from 7months. I had tried Jack with a rice cake before and he didn't seem very impressed, leaving it on the side. However, these were different Jack was a little apprehensive at first but soon finished it off asking for another. The rice cakes can become very sticky. The rice cakes are a little weird too look at as they are purple on one side and normal rice cake colour on the other, however this leaves no colouring marks. These rice cakes include apple, raspberry and blueberry and are coated with fruit juices to get the best flavour. Another snack in which we received were Sweetcorn Hoops; I had given these to Jack before and he seemed to really enjoy them. Exactly the same approach with this packet, Jack would investigate the hoops as he was able to hold them within the middle of he hoop and then eat them. They actually smell rather tasty also, I think it is unusual to find a snack which is like a crisp but Sweetcorn. My partner also thought this was a great idea, Jack finds these really tasty and has about 5 as a snack with a sandwich at lunch. The finial thing in which we had to review were Banana Baby Biscuits, again something in which I had never given Jack before. These are small finger style biscuits, like trifle sponge fingers but not as thick. These smelt lovely as Jack was eating them so I tried a little bit and they tasted lovely too, first time I had ever tried any of Jacks food. 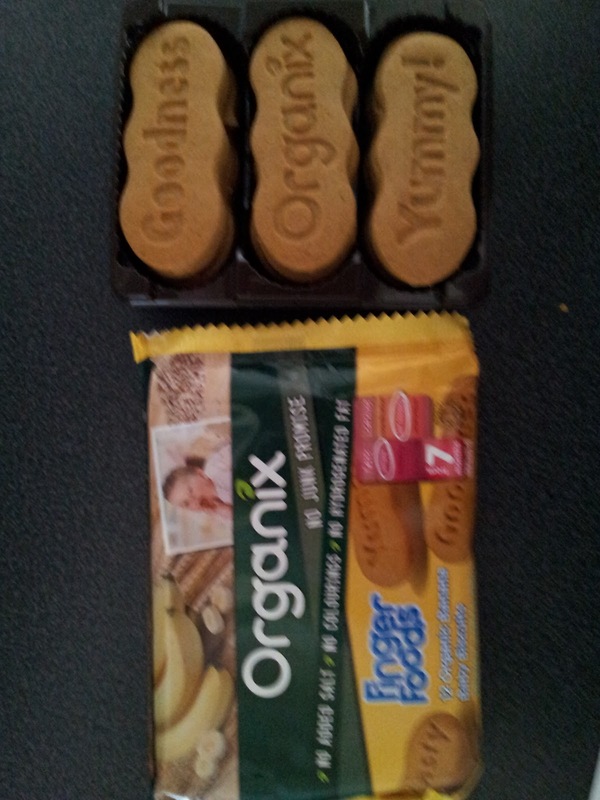 These are Organic baby biscuits sweetened with Banana Juice. Another thing I found great about these biscuits is each biscuit has a different word on them, including yummy, organic and goodness. Explaining just what these biscuits were. Overall all food included within this hamper was a big ht with Jack and he thoroughly enjoyed it all. 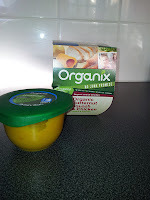 I would definitely recommend the Organix brand to any weaning parent. I especially love that all ingredients are organic and nothing unnecessary has been added, this ensures I am giving Jack only great food. 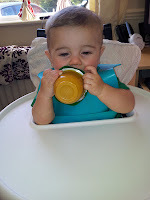 Below I have included some pictures of Jack enjoying his Organix Hamper. Prices of foods which I reviewed. Please Note. 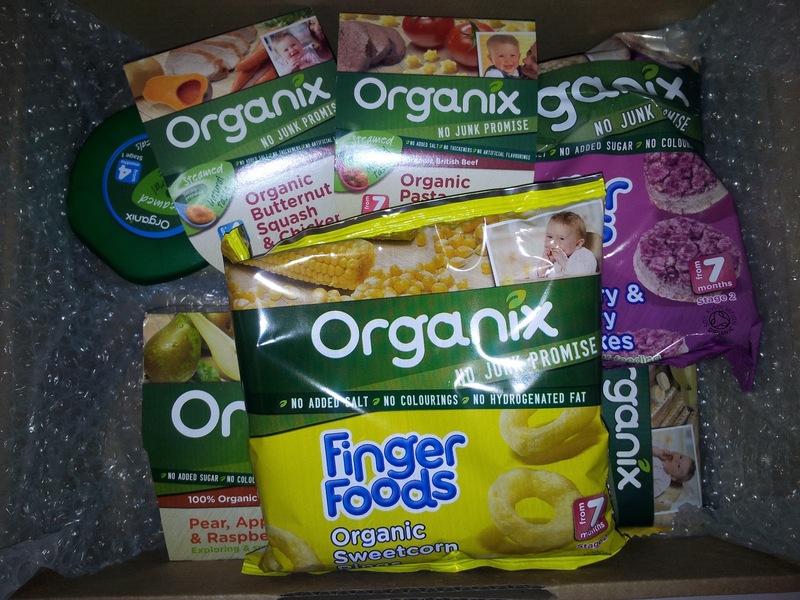 These products were sent to me from Organix for the purpose of this review, all opinions and wording are my own.